How do I turn website visitors into qualified leads? What offers convert the best? 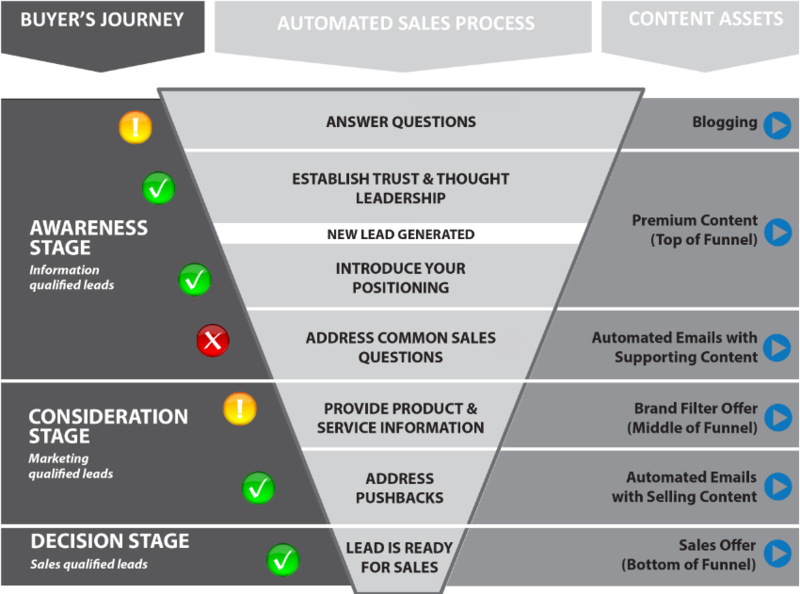 Which lead sources produce the greatest ROI? We need a marketing strategy..."
But depending on who you talk to, a "marketing strategy" could mean a lot of different things. We hear this a lot from business owners and CMOs. The clients we work with typically have tried a lot of different marketing tactics, like Google AdWords, a website, press releases, trade shows, maybe even email newsletters - but they still aren’t really sure if their message is getting to the right people. We call it "random acts of marketing" - they’re not sure if the marketing is really working in terms of generating more revenue, or how to cost-effectively scale their marketing efforts to reach more potential clients - does that sound like you? If you don’t know where to get started, or you’re having trouble tying all of these marketing tactics together into a cohesive strategy your team can follow, read on to learn more about what a Craft Impact inbound marketing strategy involves. An inbound marketing strategy will be designed just for your business based on essential information about your brand and your customers. Your Toolkit will show you the exact steps to take, the content to build, and the topics to tackle to turn your website into a revenue-generating machine. Many prospects we talk to are accustomed to the "find and fix it model," where the marketers identify deliverables that badly need to be cleaned up and updated with current information. Perhaps that’s a website that has been in place and not touched for 10 years, or it could be a product brochure that has outdated content. This is the marketing equivalent of “fighting fires” - pick the low hanging fruit and fit in as many marketing deliverables as possible within budget. We understand these marketing one-offs are often necessary to address. But from there - consider starting with a documented inbound marketing strategy to guide your efforts. Wouldn’t you want to spend marketing budget and time on things that will produce the most ROI for your company? THE CONTENT MARKETING TOOLKIT (CMT) IS DESIGNED TO GIVE YOU A ROADMAP IN THREE CRITICAL AREAS OF YOUR DIGITAL MARKETING EFFORTS. We need to attract more visitors from your most valuable accounts. With that in mind, your content strategy should be centered around producing the right content, for the right people, at the right companies. Your website needs to be a well-oiled machine that converts your site visitors into leads. This piece of the CMB will lay out downloadable offer ideas that your prospects will find attractive, no matter where they are in their buyer journey. Example: not everyone on your site is ready to visit the "Contact Us" page and start speaking with a salesperson. For those who are simply researching and not yet ready to buy, what can you offer them? Encourage your leads to educate themselves on how your product or service may help them solve their problem. Did you know that 57% of the buyer's decision is “B2B customers reported to being nearly 60% through the sales process before engaging a sales rep, regardless of price point. More accurately, 57% of the sales process just disappeared.” Lead nurturing emails can help your prospects sell themselves, even before they get to speak with a sales rep.
a complete three-month campaign and structured execution plan that maps out exactly what your business needs to do to turn your digital marketing investment into revenue. 1-hour workshops with your sales leaders and individual sales reps. We will interview your team to identify your most valuable buying scenario: product or service, account profile and buying roles within the target account. Together we document and organize the buyers' primary challenges and the "trigger" situations that result in a need for information. We'll organize and align the common questions your sales reps receive - from common questions to final stage pushbacks. The workshops give us the information we need to align your marketing messages with the buyer's journey as they move towards a purchasing decision. A Craft Impact Marketing Strategist conducts online research to analyze and document how competitors and industry influencers are attracting and engaging your target audience. We will apply your company’s unique situation to our proven CMB process for attracting target buyers and nurturing them to sales readiness. At the end of the day, our goal with these inbound marketing efforts is to help your sales team generate more revenue with quality inbound leads. Tired of random acts of marketing? Fill out the form to the right to set up a 30-minute call to see if our inbound marketing strategy with the Content Marketer's Toolkit is right for you.